Pitches and Parking Area for Camper in Sardinia. A stone's throw from the sea of Palau and Porto Pollo, in the North of Sardinia. This paradise gives you a wealth of spaces that are unique, available nowhere else in the world. When you awake in the morning, take a seat on the veranda overlooking the archipelago, and let your eyes and your mind be carried away. If such a thing as the earthly paradise does exist, it’s sure to have the same colours as are to be found here on Sardinia’s north-eastern coast. An enchanted holiday surrounded by wild, uncontaminated nature is within reach if you choose to stay at the Isola dei Gabbiani. The landscape here takes the form of a series of bays, inlets and little beaches that conceal sheltered hideaways and precious landing places. There is a premium pitch just waiting to welcome your camper van into these unique natural spaces – each different and each as magical as the next. Your senses are sure to be reawakened by such intimate, evocative contact with nature. 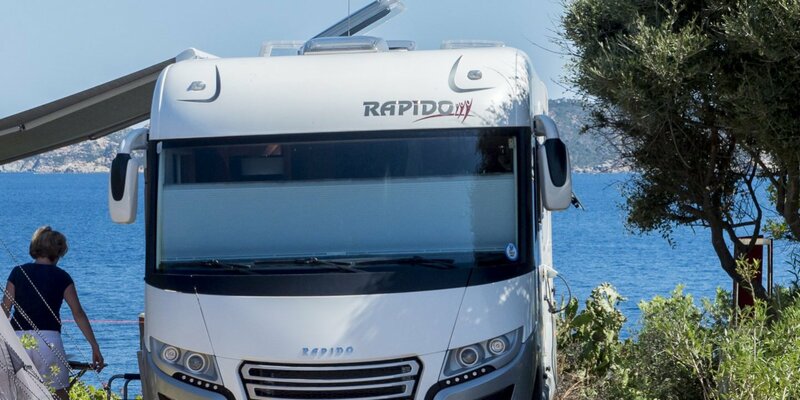 An automated camper van service will deal with all of the routine operations on your arrival and when the time comes for your departure. You simply need to use the free electronic key that will be given to you when you check-in.